Can you imagine how the prospectors looked when they came back from the Yukon? Frazzled and filthy, skinny and strong, their eyes alight with adventure. They had left their friends and family behind to travel into the unknown only to be met with snowstorms, crooks, and the quiet test of perseverance that nature always provides. But these men and women did something that seemed superhuman: every single person who ventured north helped build a local economy that would spur America out of an economic depression. They unknowingly catapulted the nation out of poverty and into a decade of prosperity. Back in the 1800’s, America didn’t suffer from economic “recessions” or even “depressions.” We had economic “panics,” and these were appropriately named. After the Philadelphia and Reading Railroad (hello, Monopoly!) declared bankruptcy, people rushed to withdraw their funds from banks, making the economy plummet. The Panic of 1893 inflated the unemployment from 3% to 11.7%, then to 18% by 1894. To put it mildly, things were dire. So what pulled America out of these tumultuous times? The same thing that saves our nation from most economic depressions: Hope. In this case, hope came in the form of Alaskan gold. Even though only a few prospectors struck it rich, every person who hiked the trails up to Alaska and the Yukon helped build a growing and prosperous economy. The Klondike Gold Rush was not the first sign of precious metals in The Great North, and local prospectors were already in search of their fortune. In the ten years before the Klondike Gold Rush, two smaller gold rushes attracted miners to Alaska and the Yukon. In 1886, gold was discovered at the intersection of the Yukon River and the Fortymile River, forming the first town in the Yukon Territory, appropriately called Fortymile. Seven years later, gold was discovered in Circle, Alaska, transforming the small trading post into the largest mining town on the Yukon River. To be sure, prospectors were searching for gold among the Alaska and Yukon river beds long before the Gold Rush began. Many of the people who struck it rich in the Klondike Gold Rush were these men: local miners and travelers on the search for veins of gold they knew existed in the northern parts of Alaska and the Yukon. This headline from the Seattle Post-Intelligencer on July 17, 1897 sent the message across America loud and clear. Local prospectors had been mining gold along Rabbit (now called Bonanza) and Eldorado Creeks over the winter of 1896-97, and the ice on the rivers was finally melted enough to transport the gold to Seattle to sell. 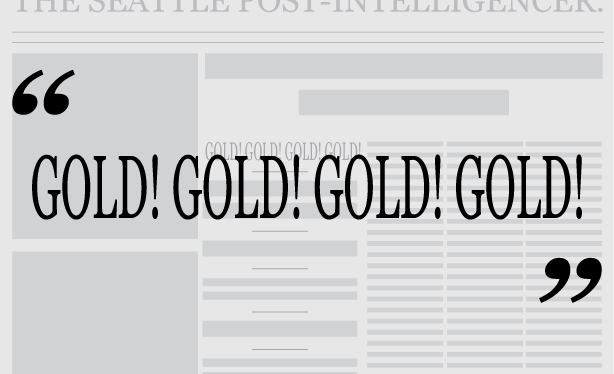 When the gold (and news) arrived in Seattle that summer, word spread quickly of this newfound wealth available for the taking. The stampede of prospectors looking for supplies and passage to the Yukon revitalized some economies in the continental US, most notably Seattle’s. The most popular route to the Yukon gold started by taking a boat from San Francisco or Seattle to Skagway, Alaska. Prospectors flooded the Seattle streets looking for the provisions that were required by the America/Canada border control. These gold-seekers were so anxious to head north that they were willing to pay handsomely for the needed supplies. 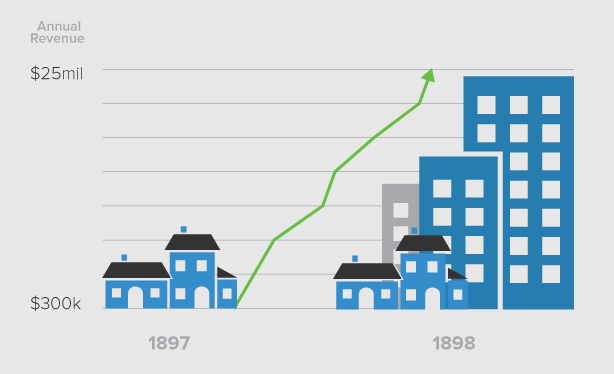 Seattle benefited greatly from the influx of travelers, and the city’s economy boomed from the stampeders’ influence. One year before the gold-seeking men and women came through Seattle looking for provisions and passage to the Yukon, the city’s business receipts totaled $300,000. In the spring of 1898, Seattle businesses had seen $25 million in sales in the past eight months. The Klondike Gold Rush helped found Seattle as a bustling port city and produced a strong economy to build from. In the summer of 1898, prospectors full of hope were boarding ships by the thousands. Most of them headed for Skagway to hike over White Pass and along the Yukon River. 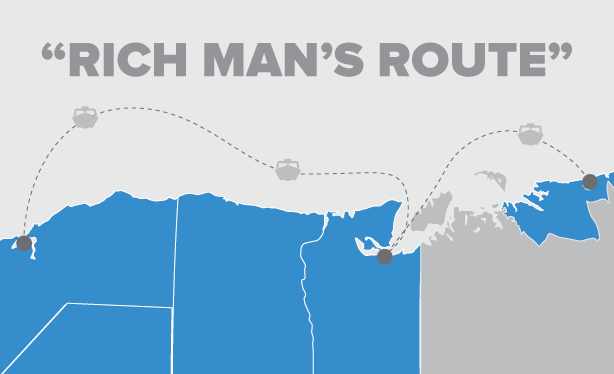 Some took the “All Water Route,” also known as the “Rich Man’s Route,” which sounded too good to be true for good reason. The promise was to ship the men and their supplies directly from Seattle to Dawson City via riverboats up the Yukon. However, the ice froze over the river most of the year, and many men were stuck, unable to travel anywhere on the frozen river. Of the 100,000 people who attempted to find gold in the Klondike, only 30,000 to 40,000 made it to Dawson City, where gold mines awaited. A few perished, some turned around and went back home, but many stayed in Alaska to build a new life. These brave men and women started local businesses to service the incoming prospectors, and many worked in local mines. It’s a bit ironic that the prospectors who brought wealth and stability to Alaska came in search of those exact things. The men who trekked into the Alaska wilderness to seek their fortune rarely found gold, but the men who stayed to start a new life helped build a local economy that also helped spur the wealth of the nation. The end of the Klondike Gold Rush was prompted by the best thing to end a gold rush: another gold rush! The Nome Gold Rush (from 1899 to 1909) is said to be the largest gold rush associated with Alaska alongside the Klondike Gold Rush. Since the Nome Gold Rush started just two years after the beginning of the Klondike God Rush, the stampede of prospectors was local and immediate. Although the Nome Gold Rush lasted ten years, it was not the only golden opportunity in Alaska at the time. In 1902, a prospector who went by Felix Pedro found gold just north of the area to become Fairbanks and convinced a local tradesman to settle there. When he sent word out about the Fairbanks Gold Rush, many of the men who had not yet left the Klondike area for Nome went to Fairbanks instead. They soon started working for Pedro, building mines and sluicing for gold in the rivers. That settlement was the beginning of modern-day Fairbanks, and was an additional source of income within Alaska that helped drive America into prosperity for many years to come. The Klondike Gold Rush provided a reason for thousands of men to seek their fate in Alaska, and most found it there, even if it wasn’t always what they expected. Today, Alaska’s contribution to our country’s history is just one of the many reasons to celebrate our great state. From viewing Grizzlies fishing for salmon to kayaking among humpback whales or sluicing for gold among the rivers like the prospectors of old, Alaska answers every call for adventure.